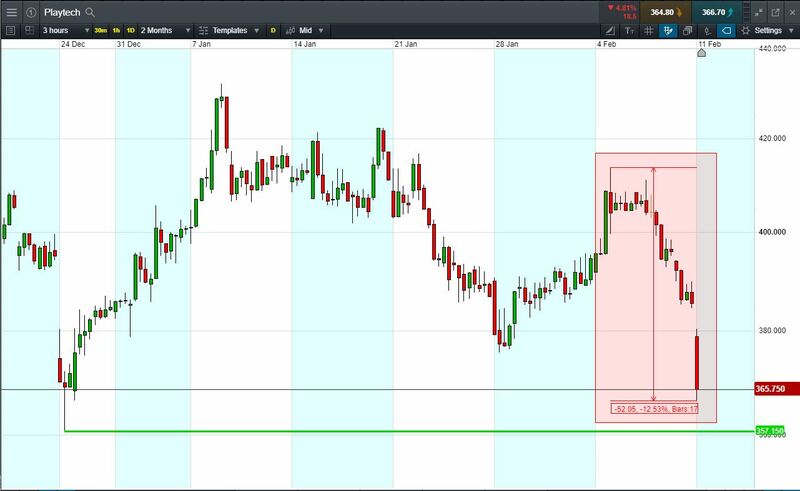 Will Playtech continue falling, or will it rise again back to 415p last week’s highs? Playtech shares -12.5% from last week’s highs; -4.5% today. 11 Feb: Bank of America downgraded the online bookmaker to Underperform. Broker cited lack of visibility in Asia for the ratings cut. Now trades 365p (at time of writing). Let’s say you feel that the stock is a bargain and you think could bounce back towards recent high of 415p. You decide to buy exposure to £10,000 worth of Playtech using a CFD, at the current price of 365p. To do this, you need £2,000. Let’s assume Playtech recovers back to 415p last week’s highs (+13.6%). Your profit would be £1360, from your initial investment of £2,000. Conversely, let’s assume you open the above position, and place a stop-loss at 6% from the current price. Playtech falls 6% and hits your stop-loss. Your loss would be £600.